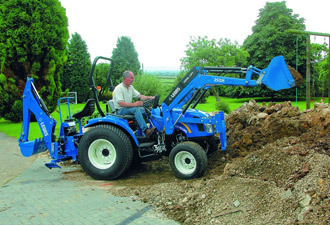 Ernest Doe has been a major distributor of New Holland tractors and compact tractors for over 50 years, both for groundcare and agricultural use. 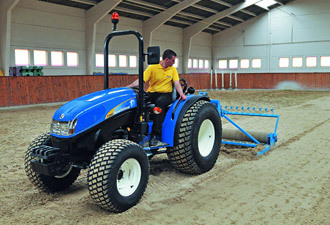 New Holland tractors and compact tractors have a reputation for reliability and innovation. The range includes a traditional compact tractor ranging from 25hp to 50hp, the Boomer 45D EasyDrive™ and Boomer 54D EasyDrive™ tractor range (2015 Machine of the Year – Compact). Both models are offered with the unique EasyDrive CVT Transmission which takes operating efficiency to a whole new level . The brilliant Boomer range bring modern levels of comfort and productivity with a compact tractor to meet the most demanding of applications. The Boomer has a large number of optional extras for operator comfort such as grille guard, rear worklight, armrest, radio and more. 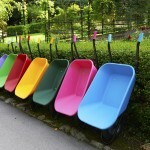 These hard working compact tractors offer fantastic versatility. A range of attachments are available for front, mid or rear use, to turn your tractor into a snow blower, a flail mower, a rotary cutter or tiller or even a posthole digger. New Holland has an unrivalled reputation for small to medium tractors. Well-proven in the most demanding applications, the light and powerful T3000 is built to take hard work in its stride. The new T4 series includes specialist tractors for vineyard and orchard use. For professional users seeking a light powerful tractor capable of operating heavier mounted equipment, the popular new T5 tractor range is second to none. As well as stocking new machines, we also sometimes have used machinery for sale – please check on our website or call your local branch. We can also service and repair New Holland tractors and compact tractors at several of our branches. View our stock of new and used New Holland tractors and compact tractors and accessories at our branches in Kent, Essex, Cambridgeshire, Hertfordshire, Suffolk, Norfolk, East Sussex, West Sussex and Surrey.